As we see economic measurements make their way across various news sites, the technology sector is particularly exciting because of its explosive growth. Smartphones especially, have enjoyed a staggering trend in growth in the global market. Samsung and Apple are obviously the two dominating forces at work on the world stage, and just like Windows Phone is vying to shore up its ascent in the operating system standing, Huawei, ZTE and LG are positioned for a knock-down drag-out fight to take on a decisive chunk of third largest number of units shipped. Smartphone shipments for the second quarter of 2013 are up over 45% compared to the same quarter last year. The gains made by LG, ZTE and Huawei are modest compared to Samsung, but are trending positive compared to Apple whose growth is showing signs of hitting a plateau with its current product line-up. 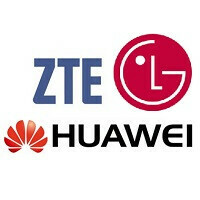 LG, ZTE and Huawei each effectively doubled their smartphone shipments compared to the same period in 2012. LG is shipping the third largest number of smartphones, reclaiming that spot that Huawei grabbed during the second quarter of 2012, but the juggernaut that is Chinese industry is trading blows every step of the way. The trio’s gains in market share are coming at the expense of Apple and all the other manufacturers. This also shores up Asia’s hold, and likely a continued ascent by China into the top manufacturers for the foreseeable future. dont u see above figure? zte grow fast more than huawei. Haven't Sony won to be the 3 largest smartphone manufacturer, end they have become? True. The average selling price of Sony should be higher than LG, Huawei, ZTE or Lenovo. What features did they copy? As seen in this chart, Nokia and Sony have no presence in the smartphone market, but their fans surely like to boast and talk smack. May be because they innovate more than other companies in the chart and their designs among the best. Is there any single feature thats innovative from ZTE, Huawei or even LG? I can say many things about Nokia. 1. 808 is the best Camera smartphone. There is no context at all. In an year, they managed to put the same camera in much thinner and lighter body with 1020. Even they added Optical Image Stabilization, better images at night etc.. 2. Lumia 920 is the first phone with display that works with gloves, keys, etc.. It also has highest screen refresh rate than any smartphone. 3. 920 is the first phone to have Optical image stabilization, great imaging in the dark without flash. 4. It has better sunlight readability than any other phone out there. Sony also makes better designs and water resistant technology etc..
Who cares about LG or its LCD tech anyway? It steals everything else and then afterwards paying license fees. Denial is a b*tch isn't it! Dude LG innovate more than Nokia do, end of! All Nokia's innovations are useless camera tech! Who doesn't care about LG or it's LCD tech? Well I do, and who would not care about their awesome LCD tech? You must like crappy displays. Right where they belong, not in the top 5. Altair is going down Altair-Loudly whining! This is very all opinion based and only through my experience in Sprint's network, but I swapped my Samsung Galaxy S4 for the HTC One and I love almost everything about it except for the fact that it seems to get hot so much quicker than the galaxy did. I would have it in my hands for maybe 5 minutes and the battery temperature would read 105 F (simple tasks like viewing calendar, messaging, etc). Flawed device? Don't know as it seems many others have similar problems, but I'm moving back to the Galaxy S4 and my flip cover. HTC was close to having a Galaxy killer for me. Sony never makes their phones available in all of the US carriers which is disappointing (I think most carriers have it excluding Sprint). I would definitely love to give their technology a try. (Bring the Xperia Z Ultra!) I'm personally really disappointed with LG's design on their G2. Their prada design and the Optimus G on AT&T (Sprint's version looks and feels cheap) had wonderful designs that I'd get right away. Never had ZTE before. Only seen a low-mid ranging phone on Sprint's network. After reading the Huawei article on spys, I think I'd rather prefer to spend my money on a different company. Their Ascend P2 was very iphone inspired too. I think at least Nokia should be #3 if not Sony. I know this is probably impossible at the moment, but it would be cool to see Blackberry come back too. Either way, I'd like to look into a different company to switch from Samsung since they're doing more than good enough financially. HTC was a little disappointing to me, but I'd give them another try in the future. Sad that right now Samsung and HTC are the only top end new devices on Sprint at the moment so there's not much selection for me. Looking forward to 2014! Don't count Lenovo out yet, The Chinese mobile phone makers have a huge advantage since most People can't afford to buy expensive phones like Samsung and iPhone. Lg could be knock out of the top five soon. Hey apple users, you think your the best. 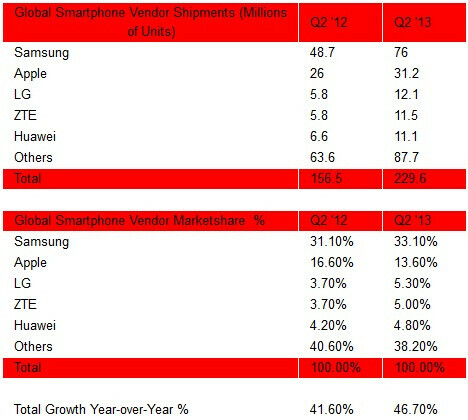 Look Samsung is DOUBLE the market share and DOUBLE the Vendor Shipments! SO stop telling me the iphone is the best! Samsung also has like 10 times more products on the market than Apple does. When you flood the market and have a recognized brand name like Samsung, it's hard not to be on top. If Apple released a new product every week or so, they would dominate Samsung. If that were true and if it was that simple to do that, please tell me why apple hasn't done that? If apple only releasing one product and Samsung releasing many has caused Samsung to dominate then what is apple doing about it? Crying and saying its not fair and only because samsung release more devices? Both companies are trying to make as much money as possible and if apple could dominate Samsung by releasing a product every week or so like you say would be so easy I think they would have done it already. You said, "it's hard not to be on top" so why aren't apple at the top? http://www.youtube.com/watch?v=Wxe_0-rttIw Watch the first minute and a half of WWDC 2013. The opening sequence explains Apple's strategy in the market. Basically, they take the approach of a few high quality products rather than flooding the market with products of varying quality, which is questionable, but it's been working well for them so far. You could say Samsung has a more broad handle on the market, appealing to everyone's needs/wants, but Apple doesn't work like that. They want to make the highest quality and most reliable products they can; they've succeeded in that and it paid off. Typical question: With all these leaks cheap iPhone being made with a glossy, plastic, multi color body instead of the usual glass/metal that makes up current Apple products, isn't Apple taking down their standards? Answer: Kind of. The more recent leaks point it as being the replacement of the iPhone 5 when the 5S comes out. It will have the same specs as the 5, but in a plastic body to reduce costs, and will probably be sold cheaply. That doesn't necessarily mean that it will lack in quality compared to other Apple devices, though. Yeah, the plastic body will be kind of cheap, but the entire experience will be maintained and up to Apple's standards. They're maintaining the quality of the experience while still reducing costs, which is better than what Samsung does.